We got home Wednesday and picked up Cat. She's a mix of needy and turning her back to us. The garden was fairly decent. The cucumbers and half the cantaloup died before we left, the winter squash was thick with red spider mites when we got home. there was only one yellow spaghetti squash so I was don't with them anyway. 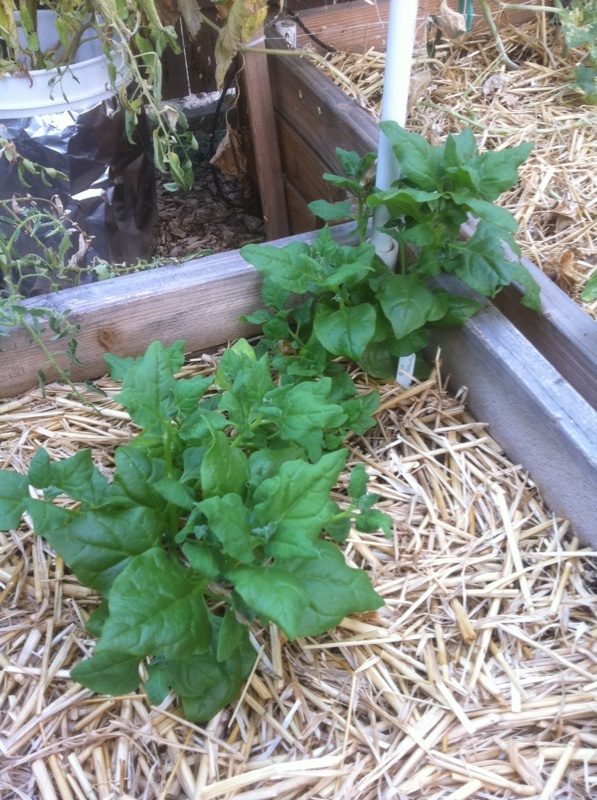 The malabar spinach is doing great. Am I supposed to stake it up? There are 2 main stems. I don't taste any sliminess. After I take out the dead plants I will have 22 squares. What should I plant at at this time? Carrots, radishes, parsnips, cumin, cilantro?? There are other beds for the kale, chard, cabbage and bok choy in October. The Berkeley compost was 130*F when we got home Wed. Today it was down to 125*f. I will turn, and water if needed, tomorrow. Show us pictures of your malabar spinach, sanderson? Mine last year was so different from every picture I've seen. What are you going to do with it and how do you like the taste? Malabar spinach, seed from Audrey. Tastes like a good green. Malabar just rambles all over. I chop it back and leave the greens I'm not going to eat right on top of the soil. It breaks down quickly and works for green mulching. So, which is it? The Malabar or New Zealand? See the "Malabar Spinach" topic. That looks like the pictures of NZ spinach I've seen. Doesn't look anything like either the malabar I grew or the still different looking malabar I've seen pictures of, which is more of a climbing vine than a bush. This one trails, so I suppose it could be staked?? The color spot out front is looking a little ragged, but the volunteer celosia are attracting pollinators. In past years I planted the vinca in a shady area not knowing that they can withstand direct sun in the hot summer. I've been working on building the soil with compost so pulling the dead dianthus and invasive grass is easy. Marc asked to see my white flower accents among the pinks and purples. 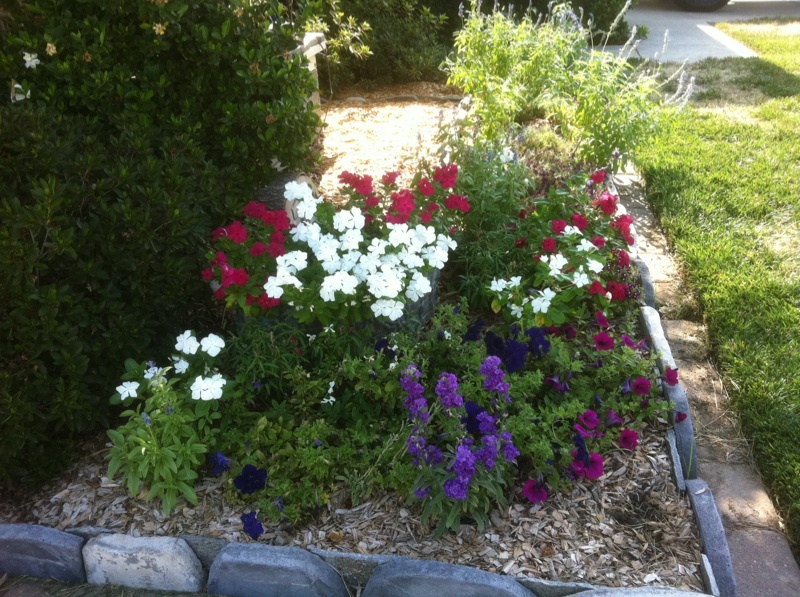 This is my BTE flower bed in the front flower bed. 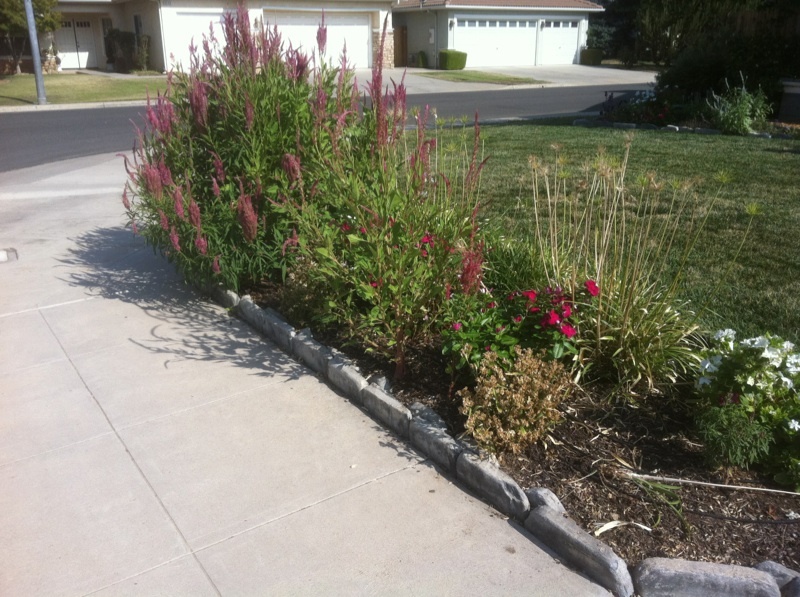 I did lose some flowers along the front because I set them out the day before it reached the 100s. Those that were successful in getting their roots down have survived this drought summer. The blue salvia are 2X - 3X the size in past years. The compost is back up to 120*F from a turned base of 80*F. Today is Day #22 so that's not bad after being left for several days. The temp was 99*F and there are 100+*F days ahead. I have a throbbing upper molar so I'm taking some codeine-Tylenol pills just to survive until Monday. Why do things break down late on Fridays?? No gardening for now. The salvia look nice. I wish they were taller. I have some too and though they are beautiful (for a while), they put up so few stems and they're so short that they barely make a dent in my brown/gray backgroiund. Your garden looks lovely, mine flower garden is ready for a clean up but that isn't happening until this heat is gone for the summer! Marc, The salvia are further down the flower bed in photo #2 with the sunshine on them. I thought these were tall by comparison. No?? Audrey, This is the time of the summer when we sing 'Should they stay or should they go?" Every time I tend the compost cage I think of you. If I had 4' piles, they would defeat me. I really, really recommend that your DH make a series of 3'X cages for you so that you are only turning 27 cu ft instead of 64 cu ft. A 3rd cage can be for the finished product. Psychologically it's easier to face. sanderson, I was talking about how short my own salvia are. I just wish that salvia in general were taller. Mine, at any rate, are pretty short. I think mine are as big as they are this summer because of the 2" of wood chips on top of 2" of compost. I wouldn't be surprised. Everything I read about mulching, and everything I try, makes me like it more and want to do it more. Friday and Saturday are supposed to be in the 80s, then back up to the high 90s for a week. With this forecast, I'm a little hesitant to start the fall/winter garden. I'm right on the cusp of pulling out some plants or letting them try for one more round of produce. There are some kind of dark aphid-looking insects on the stalks of the Rattlesnake beans. I will use the loupe to look at them closer tomorrow. I have 13 cu ft of new compost but will need to make one more batch in order to start spring planting. But, where to store the finished 13 cu ft in this small back yard is a problem. I would love to have a new 3' x 6' table top bed for some of the tomatoes but do I dare ask hubby? I'm also tired of bending over to tend the pepper pots. Maybe a 4' x 4' platform in one of the flower beds?? As you can tell, the excitement of summer gardening is waning but I'm not quite excited about winter crops. Just enjoying reading about everyone else and what you are harvesting, planting, and putting up. I often feel the same way come fall. I keep hoping for rain so I can skip a day of watering! Re another table top -- that's never a waste of time, labor or resources! It's exactly the kind of pleasant convenience they create that makes a person want to keep gardening, come whatever season, mood, or shape one's back is in. I know I've delayed watering all day today because my back is sore! Only risk I've taken was to plant a late plot of pole beans.It's so hot the tomatoes are taking a siesta and aren't putting out many new blossoms. I just hope I can keep the soil damp enough for the beans to germinate. I tried 3 weeks ago, but those were toast in the 95-97 deg. heat wave we had. The nights are getting colder, but lately the noon heat is suitable only for Camel husbandry, or air-drying laundry. I have two 4 x 8 raised beds, waist high, that I had made 14 years ago. I congratulate myself almost every day for my foresight. At 80 I truly appreciate not having to bend over to garden. @Yardslave wrote: The nights are getting colder, but lately the noon heat is suitable only for Camel husbandry, or air-drying laundry. That describes our weather perfectly! But the company was grandsons (and their parents came along with them, LOL!) Soooo, it's okay if I'm a little late on planting for the fall. I am sure Mother Nature will play catch-up. She is quite good at it. Grandkids are worth planting late. Gardening at a stand still. The air was yellow with smoke from the Rough Fire at Kings Canyon National Park. Audrey, how are you guys doing? The air has been utterly horrid the last two days. I have really strong lungs and it's getting to me. Our daughter has chronic bronchitis and she's struggling a lot with this. She has another week before heading back to LA for college. Who would have thought the air here would be 10 times worse than LA's? !